Brad Moyer goes over the beginning steps of home brewing during a class at Shippensburg University. (Shippensburg) — Brad Moyer looks like someone who would teach a craft beer class. Bushy beard? Check. Flannel shirt? Check. Laid-back attitude? Of course. So, it’s fitting Shippensburg University asked him to teach its first-ever homebrewing course. On a recent Saturday morning, about 20 people gathered in a bright dining hall on campus to learn Moyer’s secrets. Moyer started out homebrewing over a decade ago and now has plans to open his own brewery in Cumberland County this summer. He’s just one example of the rapid growth the craft brewing industry is seeing in the commonwealth. In 2011, its economic impact on the state was just over $1 billion. By 2017, that figure grew to more than $6 billion. The state added almost 100 breweries just in the last year. And Pennsylvania now produces the most barrels of craft beer in the country at more than three million per year. But people who want to break into brewing don’t always know where to turn for help. The homebrewing class is the start of a series of courses for both hobbyists and brewing professionals. Alison Feeney is a driving force behind the programs. She’s a professor in the earth science department and the author of For the Love of Beer: Pennsylvania’s Breweries. 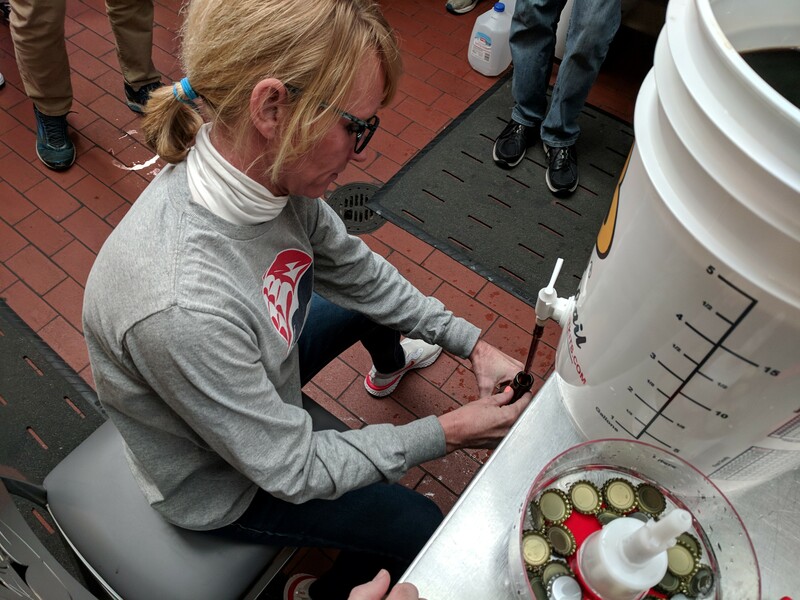 Professor Alison Feeney fills a bottle as part of Shippensburg University’s first homebrewing class. Feeney said she was drawn to the industry after she noticed how many small breweries play a role in revitalizing communities. But in doing her research, she also noticed how there was a lack of training opportunities for beginner or even more seasoned brewers. The university was awarded a $71,701 grant by the Pennsylvania Liquor Control Board in December to help build the brewing workforce. Those professional development courses are slated to start this summer. As a school in the state system of higher education, Callaghan said Shippensburg can act as a bridge to the community; an access point for anyone seeking higher skills. Professor Feeney added the school is well-positioned geographically to provide brewing education to the entire mid-Atlantic region. Longer-term, Feeney is talking with her colleagues about how they could design a comprehensive brewing degree program that would combine the science and business of beer. “Pennsylvania really, we already produce the most amount of beer. We want to make sure we also produce the best beer,” Feeney said. As he watched the day’s students bottle up samples of a chocolatey milk stout to take home, Moyer said he felt like he was going back in time to his own homebrewing days.